Aging dogs may have issues with coat, weight or illness as time passes. Dogs naturally lose small amounts of their coats every day. They also naturally shed by the bucketful twice a year. However, once they reach the end of middle age, dogs’ bodies undergo physical changes that may lead to excessive shedding. In addition, some age-related diseases may cause shedding as well. 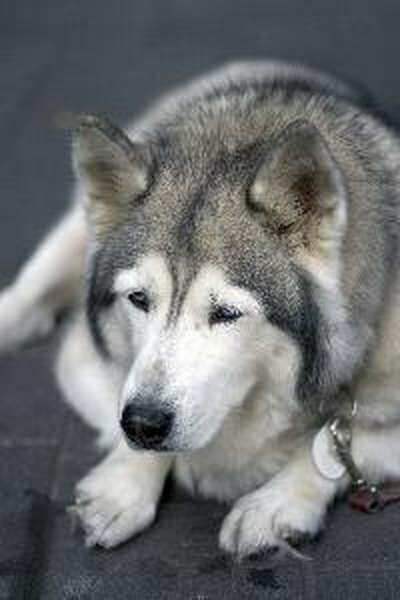 Aging dogs may develop Cushing’s disease. Cushing’s disease may occur due to failure of or tumors on their adrenal glands, or on the pituitary glands that control the adrenal glands. Dogs may lose large amounts of hair from their body without it growing back, usually along the back, tail and rear legs, if they have Cushing’s. In addition, dogs with Cushing’s will urinate with increasing frequency or quantity. Some dogs with Cushing’s develop weak muscles and lose their endurance. Senior dogs have different dietary requirements from younger dogs. Their teeth may be broken, missing or dull, making it difficult for them to chew hard food. As a result, the food they can consume may be difficult to digest, which means that they may not be able to absorb nutrients as well. Older dogs may need supplemental or special food in order to avoid hair loss. Frequent grooming, which massages the skin and helps the dog produce natural oils in the coat, may help counteract some effects of digestive issues on a temporary basis. Changes sometimes occur in dogs’ thyroid glands as they age. Dogs with hypothyroidism show a number of different symptoms, including skin abnormalities and infections, obesity and anemia. Many such dogs also show hair loss, particularly on the tail or around their necks. Certain breeds, including the doberman pinscher, the golden retriever and the Irish setter, are prone to hypothyroidism. Dogs develop additional stressors as they age. Dogs may lick themselves excessively or pull out their hair due to new aches or pains, the addition of new canine or human household members or even environmental changes. Take your old dog to the vet to rule out physical causes if her coat is coming out in clumps, if she’s eating or drinking less than she has been or if she’s showing less interest in her usual activities. Changing her routine might help her combat mild depression.